Reading and share top 10 famous quotes and sayings about Principles And Values by famous authors and people. Browse top 10 famous quotes and sayings about Principles And Values by most favorite authors. 1. "Did you notice the light that lit up the entire world?Did you feel itsfascination pressing againstyour heart?While the tingling,vibrant emotion itprojected caught all the principles of love and handed down in a miraculous way all the valuesof life." 2. "When we recognize that legal rules are simply formulae describing uniformities of judicial decision, that legal concepts likewise are patterns or functions of judicial decisions, that decisions themselves are not products of logical parthenogenesis born of pre-existing legal principles but are social events with social causes and consequences, then we are ready for the serious business of appraising law and legal institutions in terms of some standard of human values. "Felix Cohen, Columbia Law Review, 1935"
3. "For me, teaching helps to reaffirm the right principles and values of acting. It helps me focus on the good stuff that can be easy to lose sight of because the business is so result-oriented." 4. "First, individual rights cannot be sacrificed for the sake of the general good, and second, the principles of justice that specify these rights cannot be premised on any particular vision of the good life. What justifies the rights is not that they maximize the general welfare or otherwise promote the good, but rather that they comprise a fair framework within which individuals and groups can choose their own values and ends, consistent with a similar liberty for others." 5. "The single observation I would offer for your consideration is that some things are beyond your control. You can lose your health to illness or accident. You can lose your wealth to all manner of unpredictable sources. What are not easily stolen from you without your cooperation are your principles and your values. They are your most important possessions and, if carefully selected and nurtured, will well serve you and your fellow man." 6. 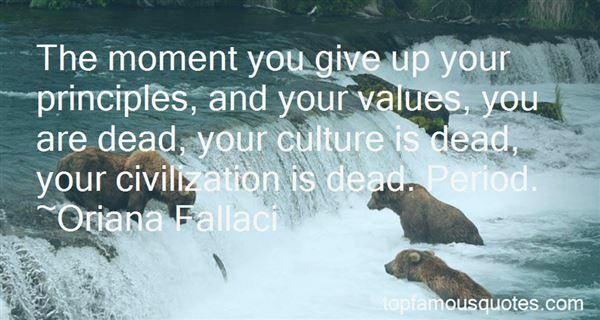 "The moment you give up your principles, and your values, you are dead, your culture is dead, your civilization is dead. Period." 7. "We believe in some basic human principles - everyone should have the opportunities not just to survive, but to excel with their God-given talents and abilities. 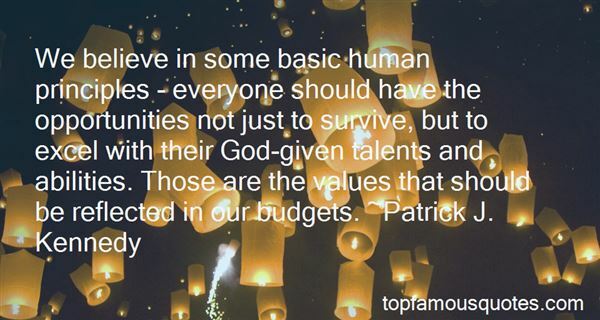 Those are the values that should be reflected in our budgets." 8. "[W]isdom is the child of integrity—being integrated around principles. And integrity is the child of humility and courage. In fact, you could say that humility is the mother of all virtues because humility acknowledges that there are natural laws or principles that govern the universe. They are in charge. Pride teaches us that we are in charge. Humility teaches us to understand and live by principles, because they ultimately govern the consequences of our actions. If humility is the mother, courage is the father of wisdom. Because to truly live by these principles when they are contrary to social mores, norms and values takes enormous courage." 9. 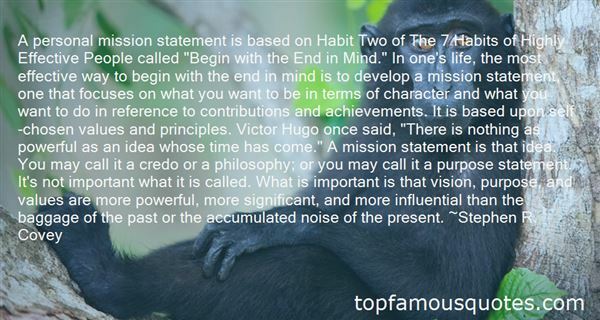 "A personal mission statement is based on Habit Two of The 7 Habits of Highly Effective People called "Begin with the End in Mind." In one's life, the most effective way to begin with the end in mind is to develop a mission statement, one that focuses on what you want to be in terms of character and what you want to do in reference to contributions and achievements. It is based upon self-chosen values and principles. Victor Hugo once said, "There is nothing as powerful as an idea whose time has come." A mission statement is that idea. You may call it a credo or a philosophy; or you may call it a purpose statement. It's not important what it is called. What is important is that vision, purpose, and values are more powerful, more significant, and more influential than the baggage of the past or the accumulated noise of the present." 10. "The attempt made in recent decades by secularist thinkers to disengage the moral principles of western civilization from their scripturally based religious context, in the assurance that they could live a life of their own as "humanistic" ethics, has resulted in our "cut flower culture." Cut flowers retain their original beauty and fragrance, but only so long as they retain the vitality that they have drawn from their now-severed roots; after that is exhausted, they wither and die. So with freedom, brotherhood, justice, and personal dignity — the values that form the moral foundation of our civilization. Without the life-giving power of the faith out of which they have sprung, they possess neither meaning nor vitality." En cambio trazo una curva. Una ola. Como un mar, o un retal de seda verde que ondea el viento. Cric, cric. Ahora ésta roca, moldeada por otras fuerzas , el agua y el viento, está modificada por mí. Y eso me gusta. Yo siempre me transformo en lo que otras personas quieren. Con Cassia en la Loma: Sólo que entonces era yo mismo."